Welcome to those of you joining me from Meet the Magic. I am the 4th stop on our Magical Blogorail. I love this topic. Walt Disney World has so much to offer and I may not ever see/do it all. It’s fun to spend a little time dreaming about what I would do if the sky was the limit. Some of my ideas are grand, others simple. Some have already received their checkmark, and others wait to be explored. Just like DisneyParks are ever changing, so is this list. As the Imagineers create new experiences, I’ll have to add to my wish list. 1. Watch my first daughter walk down Main Street hand in hand with her Granddaddy. Check. 2. Watch my second daughter walk down Main Street with Granddaddy. 3. Marry my Prince Charming at Disney’s Wedding Pavilion. Check. 4. Dine at Victoria and Albert’s chef’s table. Check. 8. Dine at Citrico’s and Narcoosee’s. 9. Take an Illuminations Cruise. 11. Take one of the special Animal Kingdom tours. 12. Take my girls to tea with Granny at the Grand Floridian. 13. Ride Dumbo with my girls. 14. Attend Party for the Senses. 17. Plan a family/friends trip for our wedding anniversary. 18. Dance with my girls during a Magic Kingdom parade. 19. Get first haircuts for the girls at Harmony Barber Shop. 20. Run a Disney marathon and be cheered on by my family. Check. 21. Run a Disney marathon and be cheered on by my family, including "Go Mom!" signs from my daughters. 22. Surprise my parents for their anniversary at Cinderella's Royal Table. Check. 23. Send my husband on one of the fishing excursions. 27. Go to Disneyland and get a tour from Chad at Days in the Park. 28. Try a Grey Goose slushie once I am finally not pregnant on a WDW trip. 29. Attend a Wishes dessert party. 30. Never stop adding to this list. This is a topic the Growing Up Disney family also had on our to-do list, so the guys have participated too. Check back tomorrow for their bucket lists. Your next stop on the Magical Blogorail Loop is Pursuing the Magic. 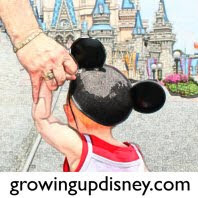 Growing Up Disney will be moving to the Magical Blogorail Red starting in April. Por favor mantengase alejado de las puertas. what a sweet list! I love the "simple" things that involve family! that's what makes the disney memories so special!! loving your disney bucket list!! What a great list! I absolutely love that you have the ones that include your daughters and their grandfather - so sweet! Great list. Very inspirational. I have a lot of catching up to do. Can't wait! Thanks everyone! And Kristen, I am jealous! I'm a fan of the slushies! I am also a fan of the Grey Goose Slushes! Great family list! I love your list! That is what it is all about....family and loved ones. What a fantastic list! BTW...I may need to try a Grey Goose Slush...never heard of it. I like the last one! Even though I haven't been to WDW all that often, there is always something new that gets added to the list. Currently, the top of my list is to try a Dole Whip!